Tonight in Northern, B.C. 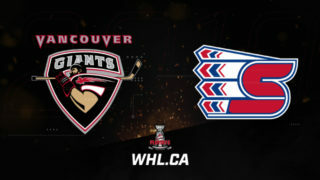 the Vancouver Giants kick off a three-game B.C. Division road swing when they take the ice for the seventh time this season against the Prince George Cougars. Tonight’s meeting is number two of four total meetings between the two sides in an eight-day span. The Giants are 5-1 so far this season against Prince George and are 2-0 so far in Prince George. The Cougars are winless in their last nine games and are looking to buck that trend tonight on home ice. Last Game: A 4-2 loss on Saturday night against Vancouver. 1999-born forward Josh Maser is one goal shy from reaching the 20-goal mark for a second straight season. The product of Houston, B.C. comes into action tonight ranked second in team scoring and tops among all Cougars in goals. Maser had one of the Cougars two goals on Saturday against the Giants and he’s tied with Vladislav Mikhalchuk for the team lead in points against the Giants with three. 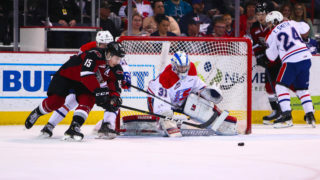 Last season Maser had a four-goal game against the Vancouver Giants in what ended up as a 4-3 overtime win for the Cougars over the Giants. Ironically Ty Ronning had all three goals in response that night for the G-Men. One of the more understated success stories coming out of Prince George this season has to be 2000-born defenceman Cole Moberg. The North Vancouver, BC product reached the 10-goal mark on Saturday night and coming into tonight’s game he leads all Cougar defencemen with 27 points. He’s already 16 points and eight goals ahead of his point totals from a season ago. Recently Moberg was ranked #175 on NHL Central Scouting’s Mid-Term Rankings List for North American skaters. 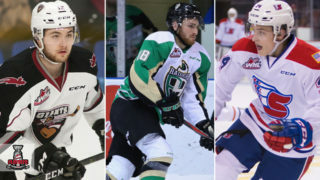 Only five WHL defenceman have scored more goals this season than Moberg. 2001-born goaltender Taylor Gauthier will almost certainly be getting the nod tonight in goal for the Prince George Cougars. The draft eligible netminder got the night off on Saturday in favour if Isaiah DiLaura, but tonight he’ll be looked upon to lead the Cougars out of their losing skid. Gauthier is 0-3 on the season against Vancouver, but his goals-against-average of 2.37 and his save percentage of .920 have been strong. For the season he’s 12-20-2-1 with three shutouts, a 3.01 goals-against-average and a .908 save percentage. 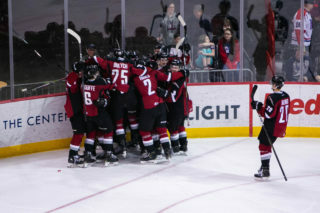 Saturday night at home the Giants were led offensively up front by Calgary Flames prospect Milos Roman who struck twice to become the second Giant on the season to reach the 20-goal mark. 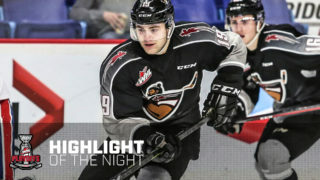 Prior to Saturday, Roman had gone nine games without a goal – Which was the longest drought of his WHL career to this point. The positive thing with Roman though, is even when he’s not scoring he’s helping the team win. He’s used by Michael Dyck in all situations and comes into tonight’s game looking to build off Saturday’s strong performance. Remember, he did have a six-game goal-scoring streak earlier this season. He leads all Giants with three goals against Prince George this season. The now 18-year-old goaltender improved his record to 3-0 against Prince George thanks to a 15 save victory Saturday night at home over the Cougars. Miner’s goals-against-average against Prince George is 1.67 and his save percentage is .941. Coming into action this week Miner is tied with Ian Scott for the WHL’s best save percentage and he sits second in goals-against-average. His overall record of 17-4-1-0. 10 different players have scored at least one goal this season for the Giants against Prince George. Brayden Watts and Bowen Byram lead the Giants with five points each against the Cougars. Over the past 30 meetings between these two teams, the Giants are 13-12-3-2 against the Cougars, meaning they’ve earned points in 18 of those 30 contests. The Giants are 7-5-1-1 in Prince George over the past five seasons.